[SOLVED] My GPU is overclocking itself way to high. I have a Gigabyte GTX 960 windforce and out of the box it has een boost clock speed of 1200 mHz, but since the last few weeks my gpu has been overlocking itself to 1390 mHz. Which causes a lot of stuttering in games. 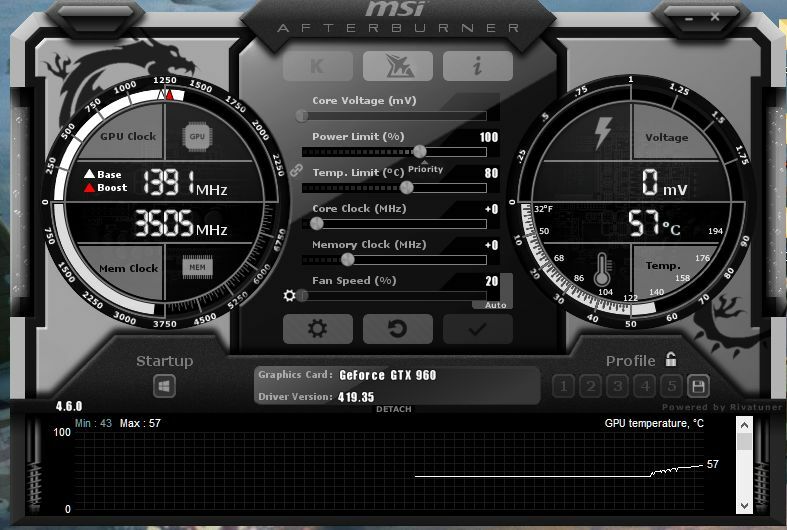 I tried underclocking my card with msi afterburner, but my gpu keeps its clock speed at 1390 mHz. I tried reinstalling older drivers and the new drivers, but the clock speed stays at 1390 mHz. Have you tried upping the power limit? When did it start to happen, after new driver update? Unfortunately upping the power limit doesn't change anything even after a full pc restart. 2 days ago it started, but I can't remember installing new driver. I would suggest you older drivers. LIke 417 or similar. I didn't fix the high overclock, but I got rid of the game stuttering by upping the power limit and upping the memory clock.